American manned spaceplane. Study 1966. 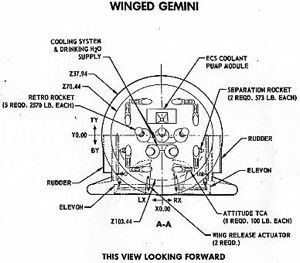 Winged Gemini was the most radical modification of the basic Gemini reentry module ever considered. Status: Study 1966. Thrust: 57.13 kN (12,844 lbf). Gross mass: 3,200 kg (7,000 lb). Unfuelled mass: 3,075 kg (6,779 lb). Specific impulse: 255 s. Height: 4.47 m (14.66 ft). Span: 3.81 m (12.49 ft). Drawing on the results of the ASSET subscale winged reentry vehicle program, McDonnell proposed a version of the spacecraft using the same internal systems but capable of a piloted runway landing. It seems the design may have also been part of a covert Air Force program to field a military manned spacecraft at minimum cost. The spacecraft was designed for launch by the standard Titan 2 Gemini Launch Vehicle. 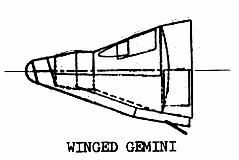 Unlike the ballistic Gemini, winged Gemini was not designed to maneuver in orbit (launch on a Titan 3A or 3C with a transtage would be required for that capability). Separation from the launch vehicle was made by 2 x 260 kgf solid motors; attitude control in orbit was provided by 8 x 45 kgf bipropellant thrusters at the base of the vehicle; retrofire was initiated by 5 x 1165 kgf solid rocket motors. ...recently I was involved in a cycle of lectures, concerning manned spacecraft configuration, at the Aerospace Engineering Dept. of the University of Naples..analyzing the Gemini family. I found that the drawing of the Winged Gemini in your page (credited Glen Swanson) is completely wrong. 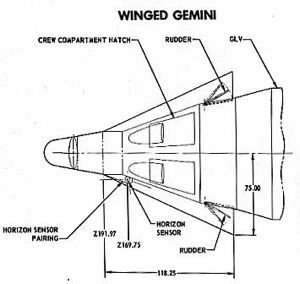 This drawing is clearly taken by the Flight Manual of the Gemini .and modified with the addition of a mid-line sleek triangular wing and "subsystem interconnection" (??!!) on the bottom. As you said Winged Gemini was derived from the experience gained by the ASSET program. If you analyze the ASSET drawings you will find a bi-conic re-entry spacecraft with a low cranked arrow wing. Interestingly if scale-up the ASSET layout drawings you will match exactly Winged Gemini configuration (as portrayed in the other drawings). These considerations put a new light on the ASSET (AEV and ASV) program - it seems clear that ASSET was never a subscale model of the X 20. In fact, there are a lot of configurational differences between the two vehicles, the former being a bi-conic shape with a very reduced wing without a vertical stabilizer, the latter was a "classic" hypersonic >75 deg degree delta wing with . two huge vertical stabilizers. It's also clear that the performances of the two vehicles (especially re-entry footprint crossrange) were completely different. This leads (me) to think that ASSET could be a completely different spacecraft configuration later adopted by the hybrid Gemini capsule to increase its re-entry performance. The whole project was managed by Mc Donnell, which built both vehicles, under the cover of USAF funds (I always wondered why, if ASSET was a subscale model of X-20, why was it built by Mc Donnell, and not by Boeing, as prime contractor of the Dyna Soar project......?). Following this train of thought it seems that the USAF (after cancellation of the X 20), continued to seek to have a small, and even cheaper, spaceplane obtained by the merging of the ASSET configuration and a Gemini spaceframe. Such a vehicle could be launched by a Titan II directly from a ICBM silo at Vandenberg AFB, in space interception mission with a highly secret profile. 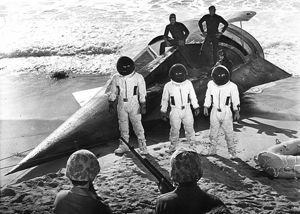 Another strange element of Winged Gemini is its connection with the Icarus manned spacecraft portrayed in the 1969 film Planet of the Apes. Art Director William Creber has said that the design was a melding of Winged Gemini and DynaSoar - "it was what NASA was doing at the time". But the Winged Gemini configuration did not surface to public view, so far as was known, until it was publicized on this web site in 1998. Did Weber have contacts in the Air Force or aerospace industry who passed him artist's concepts of the concept? 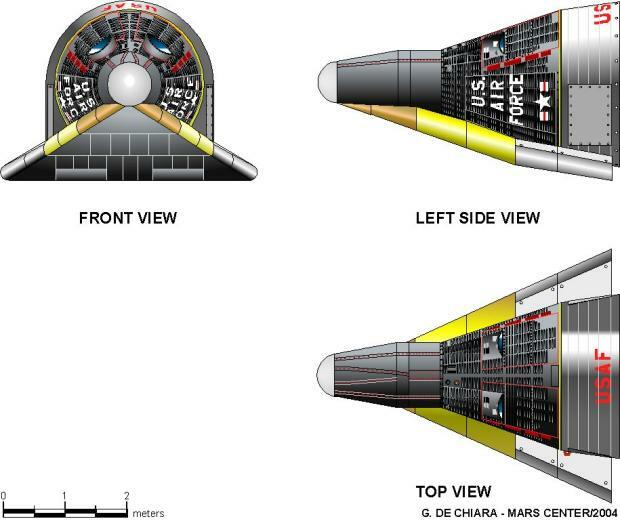 The Icarus was immensely sleeker than the Winged Gemini design (and more reminiscent of the bogus NASA drawing). It was striking, memorable, and has drawn a cult following over the years (as attested by the web sites in the references below). Crew Size: 2. Habitable Volume: 2.55 m3. Spacecraft delta v: 100 m/s (320 ft/sec). Family: Spaceplane. People: McDonnell. Country: USA. Launch Vehicles: Titan. Propellants: Solid. Agency: NASA. Bibliography: 208, 4467, 4468. Top view of Winged Gemini, the most radical modification proposed. Drawing on the results of the ASSET subscale winged re-entry vehicle program, McDonnell proposed a version of the spacecraft using the same internal systems but capable of a piloted runway landing. The spacecraft was designed for launch by the standard Titan 2 Gemini Launch Vehicle. Rear view of Winged Gemini, the most radical modification proposed. The Gemini propulsion systems contained in the basic Gemini retrograde and equipment modules would be repackaged within the jettisonable adapter section of the spacecraft. Five instead of four re-entry rockets were required for retrofire due to the increased mass of the return vehicle. Swing wings would be deployed after re-entry to allow for a runway landing. Side view of the Winged Gemini. Drawing uncovered by Glen Swanson at NASA in 2000. It is substantially different from the configuration portrayed in NASA documents of the 1960's. 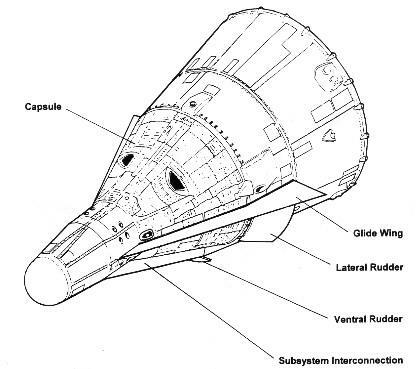 Was this part of a cover-up of the true configuration of the spacecraft? Or a 1990's hoax?